This week marks the end of a month-long campaign by the group Lift Redfern to present a signed petition to the State government to make equitable access to Redfern railway station a priority. The petition needs 10,000 or more signatures in order to be tabled to force debate in New South Wales state parliament. Last week the group had achieved just over 9,000 signatures. Lift Redfern is a collective of various community groups affected by the lack of accessibility at the station, including local businesses, arts groups, residents action groups, Aboriginal community groups, local political branches and representatives and other community service providers. Over 20 years ago the government promised Redfern would be upgraded to improve facilities and make it accessible to people with disabilities. 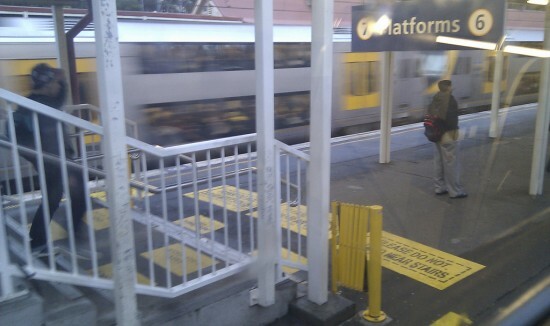 Redfern station is a busy transport centre without access ramps, lifts or wheelchair accessible toilets. The Lift Redfern campaign was launched in response to inaction as successive government ministers have failed to provide a timeline for improvement works. Carriages and Platforms Week, the beginning of the month-long signature push campaign, was launched on March 19 with Lord Mayor of Sydney Clover Moore MP, and Disability Discrimination Commissioner Graeme Innes, in attendance. Redfern station is one of the busiest in the state as an interchange for buses and provides connections for almost fifty thousand local residents, workers and students who pass through on weekdays. Commissioner Innes noted, “Transport providers are required to make their infrastructure accessible over a 20 year period. We are halfway through that timeline, so by the end of December 2012, there must be 55 percent compliance, yet Redfern station is still not accessible”.